Ask fellow campers about "Seminole Campground and RV Park" and nearby attractions. This campground is near enough to the beaches yet off the beaten path. Quiet and clean. Wonderful heated pool. Friendly and helpful staff. We camped at Seminole Campground and RV Park in a Travel Trailer. Staff member took us to our spot and helped get us backed in and set up. Another gentleman was also extremely helpful with questions and security concerns. Great guys and terrific ambassadors for the park. Best check in ever. Almost everything went perfect. Almost. 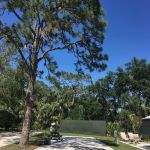 We enjoyed the excellent accommodations, including a beautiful pool area, a shady oak canopy, 50 amp electrical service, wonderful check in staff and especially the swift response to a security concern. Sadly, on day one of our visit, on a trip to the public rest room, a drunken "want a be" shower room policeman confronted me about "who" I was. A tipsey full time resident questioned me upon arrival at the park about my being a paying customer of the RV resort as apposed to a "vagrant " using the facilities. While at first I was uncomfortable with the audacity of another guest confronting me at the shower house, I was quickly impressed with the way, on duty, staff and the ownership gave quick attention to my concerns. While, I still believe, the full time resident of the park who rudely confronted me was completely out of line, I am happy that on site staff members took swift action to correct the situation. Unfortunately "rude folks" occasionally show up even at great RV Parks and the rest of us have to deal with them. The most we can expect and hope for from park management is to "fix the impropriety " and make the RV good folks feel safe and secure. Seminole ownership has shown my wife and I that they truly care about guests and have I believed properly counciled the "potty police" and ask him to refrain. We plan to return, expecting our next visit to go without a hitch. Thanks for addressing our concern. 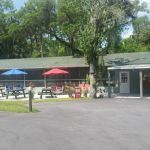 Even with this episode putting a shadow over our first visit, at Seminole, the RV Monster still rates the Seminole RV Park an excellent rankings and a 9 overall. Thanks for your swift attention to what could have been "deal killer" for the RV Monster. Friendly park and nice folks. Went to pancake breakfast and felt welcomed and would like to return. Lots of activities going on with active guests. We'll be back. We camped at Seminole Campground and RV Park in a Travel Trailer. Lots of activities, including beaches, shopping, and local site seeing in the immediate area. Grocery stores, restaurants, and fast food are very near and convenient. We came down to N. Ft. Myers for a Holiday vacation. It's very esay to get to this place off of I-75, though when making a left turn onto Triplett road with a 40ft RV, the road is only one lane and extremely tight to make that left turn. We arrived on Thanks Giving Day and pulled into the park. We were greeted by a very nice staff member who showed us to our site. This RV park is tucked away under a canopy of oak trees, secluded but you can hear some hwy noise, near the entrance of the RV Park only. The road in the Rv park is very small and has tight turns. We stayed in site #116. If you have a big rig like ours it was tight to back in. On this site there was barley enough room to put out our awing, it almost touched our neighbors coach. The inside sites are much closer together than the outside sites which have much more room. The RV sites are very nice, and you have a clean pad to put out all your gear. There are a lot of full-timers here, and understandable. You are packed in like sardines, but it's really not an issue. The staff here is really nice. Garbage pickup is twice a day & recycling!!! The front office has great information. A member of staff who works here full time, washed and waxed our coach for a fantastic price. So if your coach is in need of a wash and a wax, ask. Awesome person!! If your coach is in need of work while you stay here, the front office has all kinds of business cards to get your problems resolved. This place states it has a new bath house never used it. Also a large laundry room. The workout room smells really bad, like a tire store, rubber smell yuk! Just down the road on 78 about 2.9 miles away on the right hand side of the road across the street from Publix, is the famous bald eagle Harriet and M-13 nest. We got to see first hand of the changing of the guard last night, as one eagle flew out of the nest and the other flew in for the night watch. This place is a little pricey, but good. Places is friendly. We camped at Seminole Campground and RV Park in a Motorhome. Publix is down the road 2.9 miles off of Bayshore. Eat at Blue Dog Bar and Grill. Get your rv washed and waxed by Tommy. What a fantastic place this is. We stayed here before and after reading a couple of negative reviews we decide to give our review now. Upon arrival we were greeted by the staff to assist us in parking our class A coach, who never left until we where all hooked up. This doesn't always happen across the country. We enjoyed all the activities at the club house, and the full time resident's get-togethers, which also included seasonal campers. The pool was amazing and we also enjoyed the pool side parties! We believe the people that wrote the bad reviews on this website were the real problem, or as they say, the real "trailer trash". Also, after meeting the owner one day at the park during the Thursday meet & greet (with coffee & donuts supplied by the park at no charge), the bad reviews are a real slam to him! Some people just do not appreciate a good thing. You can tell he takes great pride in the park and the staff. We will be back next year! 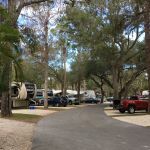 We camped at Seminole Campground and RV Park in a Motorhome. This is not an RV park, nor a campground, although that's what the name says. I am a well traveled person and I would call this an RV resort. Have you ever gone to a ClubMed? The atmosphere here is similar -its the antidote to civilization! I had a really fun time. I was escorted to my site and the managers helped me park, as a courtesy. My spot was not tight, as a reviewer wrote, and it was level right on the mark. I looked around the campground and didn't see a lot of leveling going on, so everyone must be enjoying level sites. The campground is full of trees, which makes it really nice and not an RV parking lot. The grounds are very clean and well kept with staff riding around all day keeping things in order. Trash pick up from the crack of dawn till 5pm, continuously. The well maintained heated pool is "to die for," and they have good music in the pool! The shower room is large, private, and extremely clean. There are seasonal and long term people, but everyone was so nice and welcoming. Its not clicky, as a reviewer wrote. The "fun-lovingness" of the seasonal and long term guests is contagious, and I caught a good case of "fun-loving." I won at the Bingo, celebrated some April birthdays, and did a terrible job pinning the tail on the donkey!! I disagree with every bad review written about this campground. As was said by another reviewer, this is not one of those 55 and over places. It's an active campground with active people, however if you don't want to participate in the activities in the community area, you can stay at your RV and enjoy the quiet under a shady tree, I saw that going on too. The atmosphere here makes you want to participate and have fun. I will be back again! We camped at Seminole Campground and RV Park in a Motorhome. EVERGLADES DAY SAFARI is an all day guided ecotour. Well worth the money ($145) check out their website for more info. They will pick you up at a nearby hotel where they have arranged for their guests to park while on the tour. Pick up at 8:am and drop off at 5:pm. I'm proud to call this place my home base. Close to shopping and attractions. Great dog walk, good workout room and great pool. Campground staff courteous and helpful. Good mix of fulltime and seasonal visitors. Plenty of activities. Something for everyone. The trees are wonderful. We camped at Seminole Campground and RV Park in a Fifth Wheel. We stayed 4 months 2017 and 6 in 2018. WiFi is terrible. I had to get that out of the way. They've recently started improvements. Close to 100 sites. Pool is extraordinary and always spotless as are the facilities. Staff is diligent and friendly and hardworking. Wonderful trees and shade. I've read the negative reviews and disagree. There are back stories there. If you are one of those "get the hell off my lawn" people, you will find something to complain about. We've met wonderful people here. Full timers are wonderful people. Friendly, inclusive, helpful. Some site sizes are more generous than others. Many dogs but everyone picks up theirs dog "business". Bad actors are asked to leave by mgt. We would come back and highly recommend Seminole. But alas, you get out what you put into it. Life is like that. 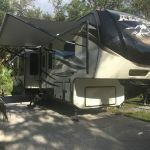 We camped at Seminole Campground and RV Park in a Fifth Wheel. Every touristy place is about one hour away. Plenty of restaurants, gas, shopping 10-20 minutes away. 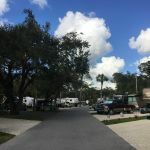 We've stayed at a handful of RV parks in the Ft Myers area and found Seminole Campground to be a perfect fit for us (literally and figuratively!). We definitely plan to make Seminole our home base as we travel back and forth thru Ft Myers. Great staff and very friendly neighbors. Beautifully kept grounds and the sites are big enough for our 40 ft rv plus cars. Pool was awesome - clean refreshing and space to chill read a book or socialize with neighbors. We camped at Seminole Campground and RV Park in a Motorhome. Close to everything you need with a feeling of being in a remote location. Perfect mix. We stayed 4-1/2 months this past winter. It was our first time here, and the park exceeded our expectations. The longer we stay the more we liked it. Lots of shade, beautiful pool, lots of activities, super clean shower rooms. Garbage is usually picked up within five minutes of putting it out. The park is spotless. Kudos to the people that work there, they're always on top of everything. The owner continuously makes improvements on the park. I can't believe how much work took place to rebuild the park after a hurricane hit last September 2017. The park was 100% when we arrived December 4. The WiFi is a bit sketchy depending where you are in the park, but they're working hard to get it running properly. We made lots of new friends from attending potluck dinners, parties, bingo, and the fabulous corn hole tournaments. Can't wait to go back. We camped at Seminole Campground and RV Park in a Fifth Wheel. The park is 10 minutes away from every store you can think of. It's about 1/2 hour away from Fort Myers beach depending on traffic. Lots of good local restaurants. The park is one minute drive off of I-75. Cant say enough wonderful things about this place. From the time we pulled into the campground until the time we pulled out everyone was so friendly. The pool is GREAT. The bathrooms are spotless, the grounds are well kept and there are activities that keep you entertained throughout your stay. I saw no indication of trailer trash during our stay. Great place! 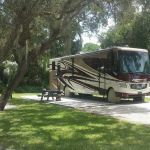 We camped at Seminole Campground and RV Park in a Motorhome. Easy access to highway, shopping and food!! What an awesome place! It is not a 55 and older park, "which is a breath of fresh air" because thats all you find down here. People are friendly especially the full time people who most also work here. The pool is awesome; it's clean warm and has music playing (a big plus), the bathrooms and showers are very clean. They come by your site and use leaf blowers to clean your concrete pad for you, pick up your garbage between 8 & 4 everyday, sites are well kept and most are very easy to get into. The park is well lit and quiet. You can tell the owner takes pride in his park as do all the full timers and employees. The bad reviews of this park are unbelievable to read, I sit here scratching my head reading them. Crabby old people is all I can say! The park and it's people are great. We camped at Seminole Campground and RV Park in a Motorhome. We have been coming to Seminole Campground for many years, but the last two years has no longer been fun. There are many reasons for this, which are as follows: Bingo -so much yelling and rowdy behavior that you cannot hear the numbers being called. Dance floor at recreation room for events is overtaken by permanent residents. Blowers are running on and off all day. People do not respect your campsite, parking golf carts on your grass. Recreation room is either hot or cold. No security. Sewer treatment plant smells, especially when wind blows. Very expensive; not worth the money. Not a good park for snowbirds anymore. We will never be back. We camped at Seminole Campground and RV Park in a Fifth Wheel. This is our 7th winter to stay at this park. This is the first year there has been a problem between neighbors (that we know about). Usually everyone gets along very well. Hopefully this is a one time occurrence. We love the people here and love our neighbors. We don't have any animals, but as in any park there are always people who disobey the rules about cleanup. We have a Class A with four slides. I wish we had more room between units, but we are not as close as some. It just depends on your size. Yes, the wi-fi is not always good, but we don't need it because we have it on our phones. There is music at the pool. We love the genre and most of the time you can barely hear it. There are trees with a lot of hanging moss so some spots cannot get good TV reception. We asked for a sunny spot. We have perfect Direct TV reception. It's too bad you just can't please everyone. We are very happy. We camped at Seminole Campground and RV Park in a Motorhome. One of the best campgrounds we've ever stayed in! Beautiful park and very friendly staff!! We camped at Seminole Campground and RV Park in a Fifth Wheel. For the past five years this was my snowbird destination park. It used to be a nice snowbird RV park. Over the last two years, the owner started to add more and more year round permanent residents. Some of them believe they own the park. I had the misfortune to have one next to me. After the third wild drunken party which goes on till midnight I complained to the owner. He said that he would take care of this. I thought that he would have them moved or removed from the park. Boy was I ever wrong. All he did was tell them that I complained about their parties. After that it became a living hell to stay there. We were harassed, intimidated and threatened. It became evident that the park owner only cares about the money. A snowbird only pays for three or four months, but the trailer trash pay twelve. The park has become extremely clicky and the permanents take over all the activities and make the snowbirds feel unwelcome. They say that they have WiFi but it's down more then working. I had to do a double take when I saw someone living in their car at an RV site. This is not an RV resort anymore, it has become high priced trailer trash park. We camped at Seminole Campground and RV Park in a Fifth Wheel. If you're looking for something near water, this isn't it except for dropping a kayak in the Caloosahatchee River. Fort Myers Beach is an hour plus away (even more if you time beach traffic wrong). Charlotte Harbor is nice, but 30-40 minutes depending on traffic. You can go to Matlacha/Pine Island area - also 45 minutes depending on traffic. If you're here in the winter, everything depends on traffic. Lots to do in the area with just a little driving. Grocery stores are Publix, Winn Dixie and Walmart. It's a great stop off if you're heading anywhere on I-75. It's beautifully shady and well maintained. Great area for heading to the beaches in Fort Myers or anything the Gulf Coast has to offer. Everyone we met was very friendly but we will not return due to spacing issues. Went to Sanibel Island and had one of best lunches ever at Lighthouse Cafe. Nice little eating place down the road a mile. Fairly close proximity to all of the grocery, drugstore, Walmart locations. About 20 minutes from downtown Ft Myers. Lots of oak trees that made for a lot of leaf blowing at our site. All around experience was good. Are you affiliated with Seminole Campground and RV Park ?